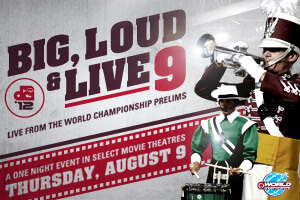 The Drum Corps International World Championships will return to movie theaters on Thursday, Aug. 9 at 6:30 p.m. (ET) for Big, Loud & Live 9. Now in its ninth year, this annual theater broadcast will capture the complete performances of the top 15 corps during the World Championship Prelims at Lucas Oil Stadium in Indianapolis, along with highlights of corps that will have performed earlier in the day. Presented in a joint effort by National Cinemedia's Fathom Events and Drum Corps International, BLL9 will be shown in record 600 theaters across 47 states, giving more drum corps fans than ever before the opportunity to experience this cinema event. Tickets ranging in price from $12.50 to $18, depending on location, are now on sale through FathomEvents.com. This year, Fathom Events invites fans to show their "badge of honor" by submitting a photo of them with their favorite corps or in their favorite corps colors. Fathom will reward an entry with two free passes to Big, Loud & Live 9 each week leading up to the event, at which point they'll announce the Grand Prize winner. The corps with the most entries will be announced during the pre-show, and everyone who supported the winning corps will win a customized set of "digital skins" featuring the winning corps. Find a theater near you, and purchase your tickets today!